Its common phenomenon that our hair is hard to clear and wash after swimming as it tangle together.we also spend much time on dealing with the hair after swimming.what's more,do you know that whether the water of the pool will damage our hair? 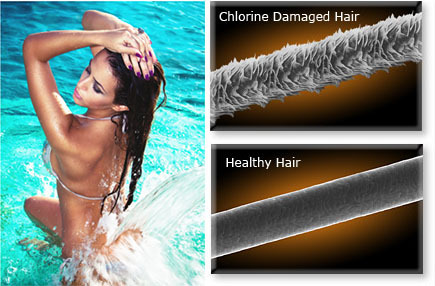 As we all know,tap water of the swimming is not only contain liquid chlorine or bleach disinfection but also people people put extra chemical component into the pool so that it can keep people from getting sick after swimming.However,the liquid chlorine and bleach is the vital element that damage our hair seriously. A survey had been confirmed that the hair will be damaged like lost luster,become dry and even brittle if you dont have the habit of rinsing your hair after swimming.In addition,the salt and grains of sand may damage your har if you comb your hair after swimming in the sea.the salt can change the cutin of hair easily when its under the ultraviolet. So,make sure you wear a swimming caps which can fix well to let your hair less contact with water when you swim in the pool or sea.remember to wash your hair with clear water after swimming.you also can use some oil to smooth the hair properly.